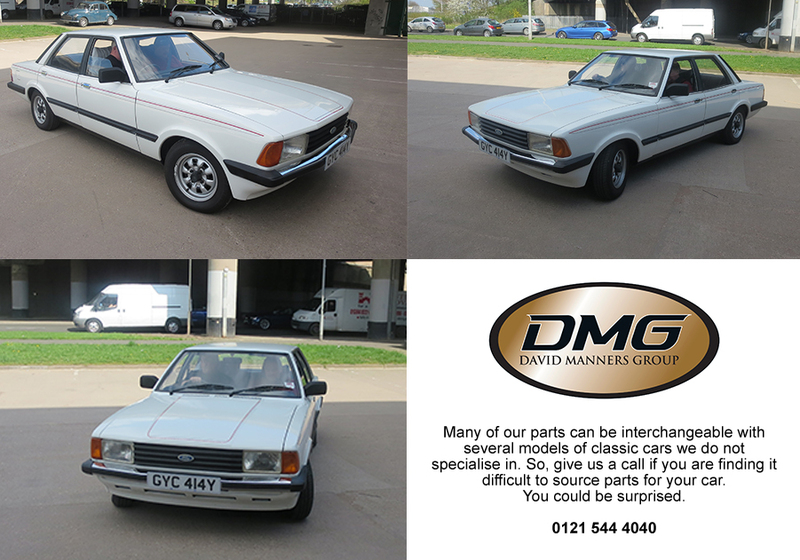 You may find it strange that we are featuring a MKV Ford Cortina on our blog. 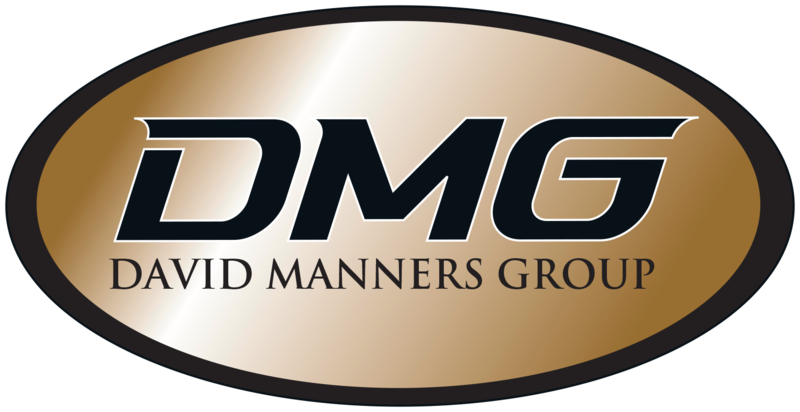 If you are familiar with the David Manners Group, you will know that our Family of Cars are: Jaguar, MG, Triumph, Classic Mini, Morris Minor and Mazda MX-5. Due to the broad range of cars, many of our parts can be interchangeable with several models of the classic cars we do not necessarily specialise in. On a daily basis, we see rare cars that were so familiar on our roads in the 1970’s and 80’s coming to buy parts from us as they struggle to source them elsewhere. This is a great example of the MKV Cortina that we so rarely see today. Our customer was buying mainly service parts from us as he often does as we keep available stock convenient for collection. He regularly takes the car to 70MPH on long journeys, but commented that the steering offers quite a workout compared to modern cars. The length of the MKV Cortina has to be seen to remind you just how long it is. Thy by-product of this is a very spacious cabin with now retro dash and interior. So, give us a call if you are finding it difficult to source parts for your car that are not necessarily part of our family. You could be surprised. Follow our Facebook and Twitter pages to see more of our customer cars. Born in the 70’s, and growing up in the 80’s meant that I was familiar with seeing Triumph Dolomites on many streets. From memory, it was the soft brown coloured Dolly that was most popular but maybe that’s because the colour seemed so infectious back in the day. It was certainly the reason I remember the 2-tone Ford Cortina of the same era with the same livery with equally fond memories. So I do have a wish list of cars that I would like to see here at the David Manners Group, a list based mostly on my youthful memories. I can now tick off the Triumph Dolomite (in the relatively short time we have been documenting them) but if any local owners of the Triumph TR7, Triumph TR8 (well we can hope), Morris Marina…ok I will stop now. I will save the list for a later date. After admiring the Dolly and taking pictures, the owner explained to me that it’s a good runner. It presents few problems but the body work needs some attention. It has never been fully restored, simply looked after from day 1. We do stock one of the most comprehensive selections of parts for the Triumph Dolomite, and you can download our free parts price list by clicking here. On Sunday 8th June 2014, a carefully picked team from the David Manners Group will take on a 60 mile bicycle ride in support of Parkinson’s UK. Led by our Sales Manager Steve Travis, our guys have already started training for the circuit which covers the beautiful Warwickshire countryside, but the demands of the terrain require consistent preparation before finally tackling the route. Many of our team have not been on a bicycle for years so this is a credit to them for taking the challenge. For this reason, there are also options for competitors to take a shorter 20 mile route which is still no mean feat! We have set up a Just Giving Page for any of our customers, family and friends to support us by donating whatever they can. We would be encouraged and grateful for your support. You can visit our Just Giving page by clicking here. If you would like to find out more about our preparations for the charity event, please follow our Facebook and Twitter Pages where you can follow our training diary over the next few weeks. 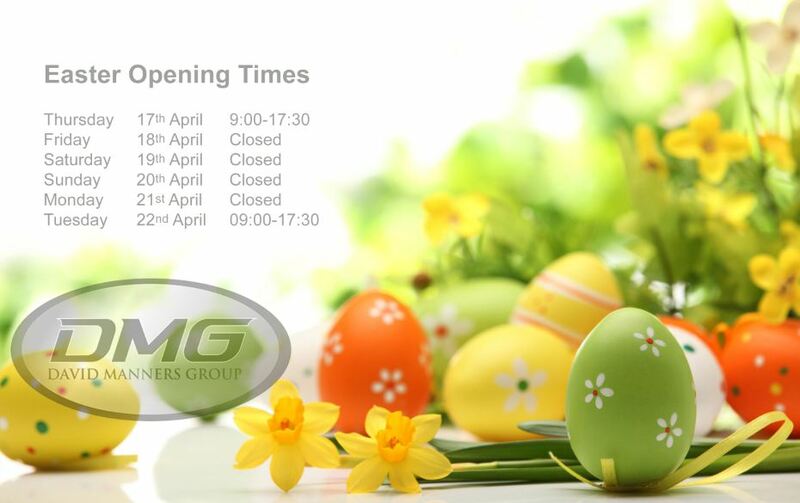 The David Manners Group will be closed for the Easter break from Friday 18th April and will re-open on Tuesday 22nd April. We would like to thank you for your business in the first quarter of 2014 and look forward to seeing you again soon. Please remember, you can still order from our website and in stock orders will be despatched on Tuesday 22nd April. We are very proud of this Triumph Herald restoration project. For 5 years now, our customer has built the entire car from top to bottom with David Manners Group parts, often sourcing incredibly rare Herald spares along the way. In 2009, our customer contemplated selling off the Herald for spares; such was the condition at the time. It was only a passing comment from a fellow enthusiast that persuaded him otherwise. The renewed vigour prompted a little bit of tinkering in the garage which eventually turned into the labour of a month’s work. At that point, there was no turning back. 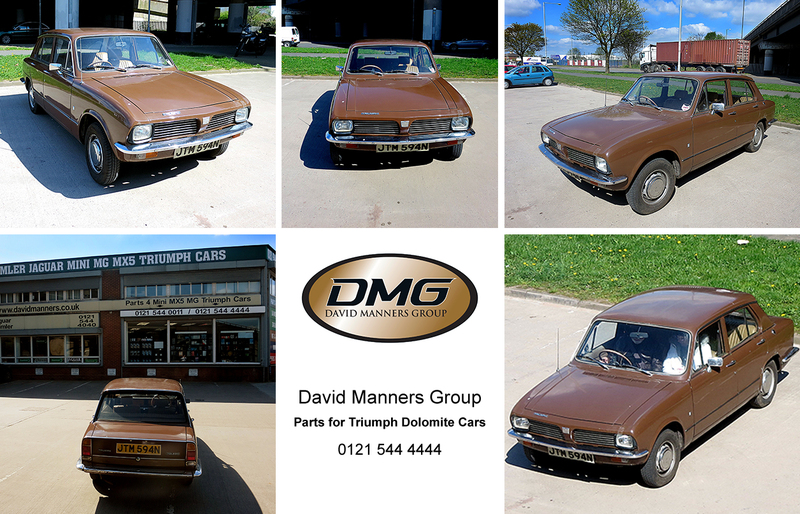 Luckily for our customer, he was already aware of the David Manners Group from buying spares for another one of his classic guilty pleasures. We had previously assisted with parts for his Daimler Dart SP250, again building it from the bottom upwards. You may remember an article from us earlier in the month where we appeared in a CAR S.O.S special on the National Geographic channel restoring a Daimler Dart. 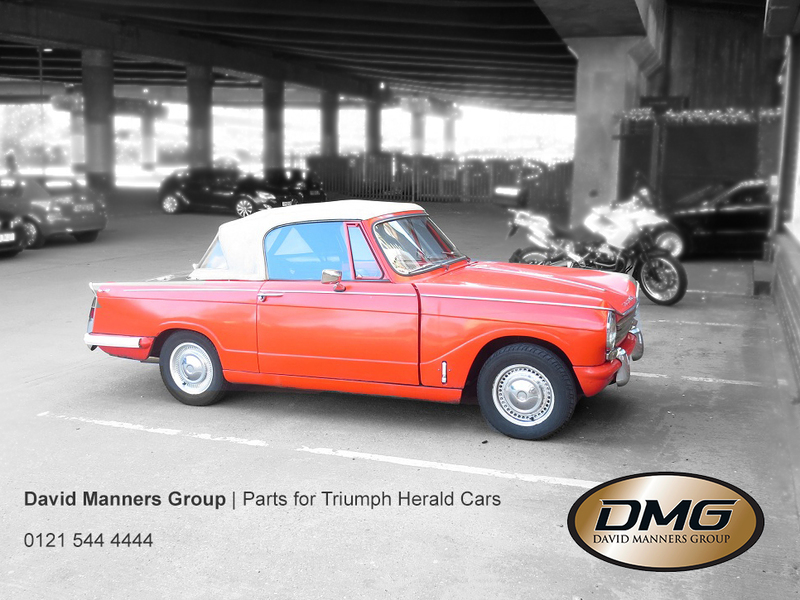 Our customer recently had a valuation for the Triumph Herald which far exceeded the amount spent on parts. He has no intention of selling though, and hopes it may even be passed down the family in years to come. A few months ago, we assisted the crew at National Geographic’s Car S.O.S show for a Morris Minor restoration special. 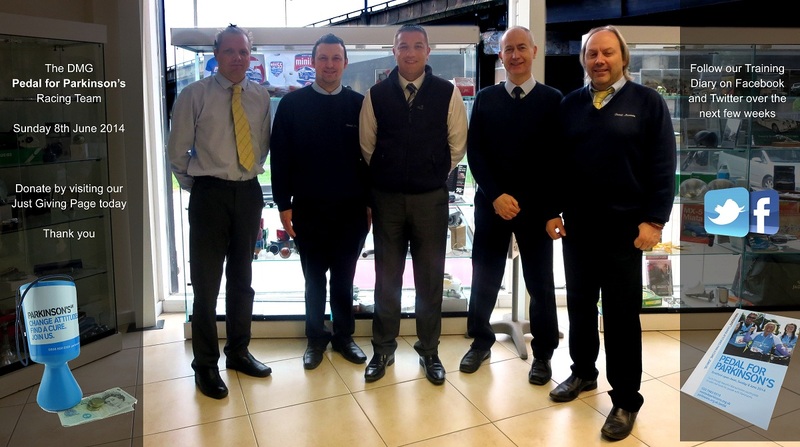 The David Manners Group started to specialise in Morris Minor parts back in 1981 in partnership with the Morris Minor Centre Birmingham and have steadily grown since. Our stock availability has increased significantly over recent years, and as such we have seen an increased number of Morris Minor’s, Commercials and Travellers using us as their main parts dealer. This also gives is the opportunity to speak to our customers and photograph their cars documenting the progress of restoration projects they may be undertaking themselves. 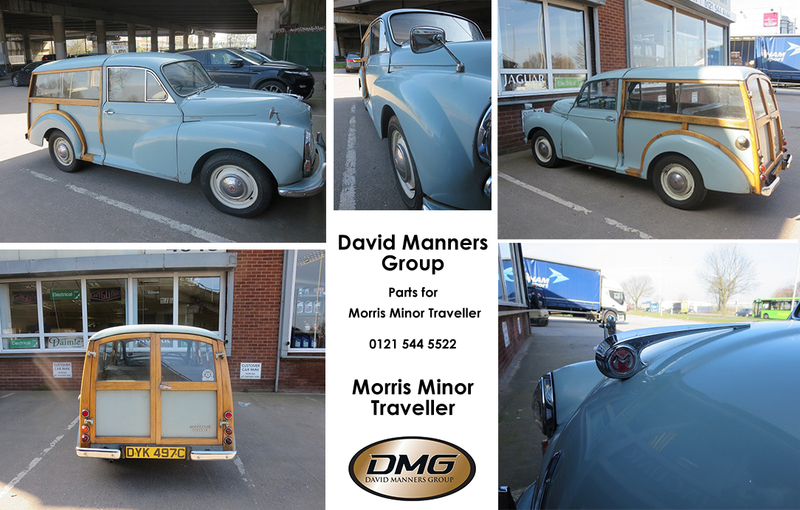 This 1965 Morris Minor Traveller is used as a daily commute, and is very much like many that we see here at DMG. Infact, we rarely see concours examples. In many cases, people are too fast to comment that the only classics of a particular marque left are the good ones. It seems with the Morris Minor, there were originally plenty of good ones to begin with. This is why they admirably withstand the rigours of modern driving. Naturally, they do require a lot of love along the way. And we do encourage those drivers who use their Morris Minor’s on a regular basis to consider part upgrades such as 5 Speed Gearbox, Shocks etc. So with our appearance on National Geographics’ Car S.O.S in the next couple of weeks, it’s nice to be able to feature some Morris Minors we have seen at DMG the last couple of weeks on the run up to the show. For regular updates, please make sure you follow our Facebook page by clicking here or visit our Morris Minor Parts website by clicking here. This is a fine of example of the late Rubber Bumper version of the MG Midget 1500 that was registered in 1976. Although not as popular as earlier Midget models, the 1500 travelled well state site and shipped over 70,000 models in total between 1974-1980. We are very pleased to showcase our customers ’76 Midget especially as it is so well looked after and used consistently and not spared for shows and performances. The renovation of this car has stayed loyal to its original specification with the paintwork a particular a highlight to the energetic colours of their day. 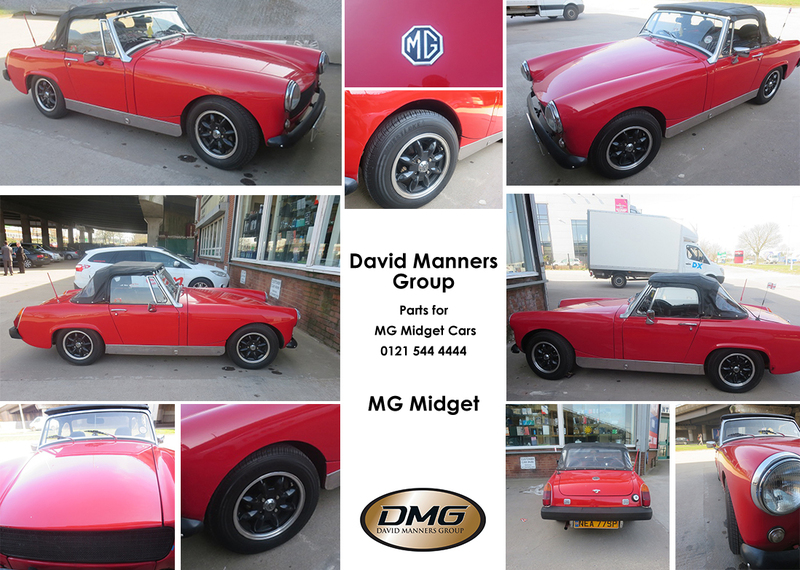 For more pictures of this MG Midget, please follow us on Facebook by clicking here.